There is no secret to a stress free holiday season. Shopping, cooking, traveling…let the list of holiday stress triggers begin! These are a few things on our minds and cluttering our desks this time of year: address labels, budgets, calendars, holiday card lists, decoration needs, gift lists, receipts, menus, recipes, stamps, travel documents, new years resolutions…blah blah blah. Tab 1: Address Labels – I print holiday address labels early November and store until it is time to mail my holiday cards. Tab 2: Budget – I keep a record of holiday expenditures each year (easily calculated with my receipt tab). Tab 3: Calendar – I record all holiday parties, appointments and important follow-ups. Tab 4: Card List – I track cards received for the past 3 years. As I receive holiday cards with new addresses I immediately update this list to keep information current. Tab 5: Decorations – THIS IS MY MOST USEFUL TAB!!! At the end of the season, as I put decorations away, I make a list of items in need of replenishment. Tissue paper, gift bags, outside lights, ornaments, holiday napkins, candles, etc. This keeps me from impulse buying in early November when holiday items hit the stores. If it is not on the list, I know I will find it when I unpack holiday decorations in a few weeks. This is a great money saver! Tab 6: Gift List – The more detailed here the better. This list is easily removable so I can bring it shopping and know who I bought for and who still needs a gift. Tab 7: Holiday Entertaining – If you are hosting a holiday or throwing a party, all invitee lists, seating arrangements, and party details should be located here. Tab 8: Receipts – Keep all holiday receipts here. At the end of the season you have a great record of total expenditures. It also makes returns a piece of cake. Tab 9: Menu – Everything you need on your table for your Thanksgiving and December holiday celebrations. Tab 10: Recipes – As I look through magazines throughout the year, I rip out any interesting recipes and store them here. Tab 11: Stamps – Buy those holiday stamps early. Tab 12: Travel – Plane tickets, hotel and plane reservations and anything pertaining to holiday trips are stored here. I hope you find this a useful tool to help plan your holiday season. 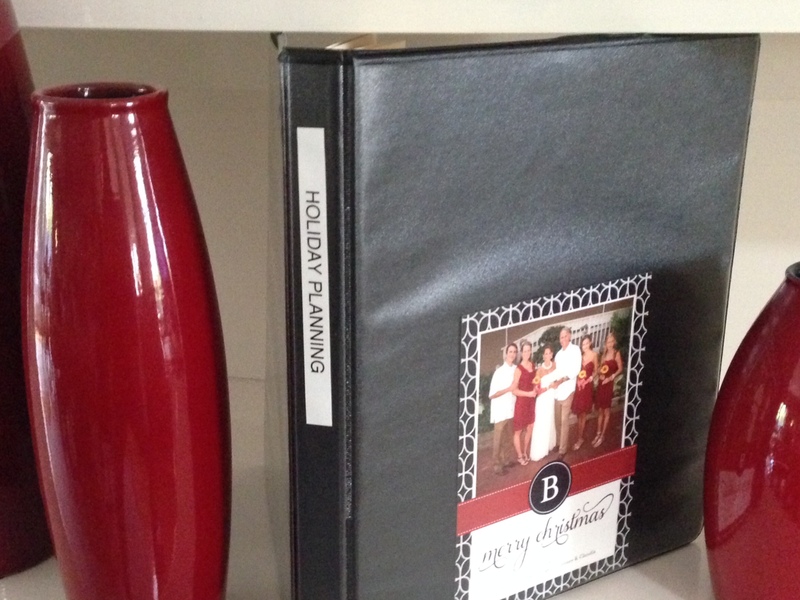 Be sure to tailor your binder to you and your family’s needs. Happy Organized Holiday to all, and to all a good night! !